For almost eight years, the Ramel family has been battling in court over the sale of the Trakehner licensed stallion Insterburg. The German appeal court in Celle has now ruled in favour of the Ramel family on the basis of “fraud”. German equestrian magazine Reiter Revue broke the news that the Ramel family won in front of the Appeal court of Celle. In April 2010 Antonia’s mom Henriette Ramel bought the then 11-year old licensed Trakehner stallion Insterburg (by Hohenstein x Giorgio Armani) from Dirk Schultzke, who had inherited the horse from his late father. He had no interest in keeping horses. 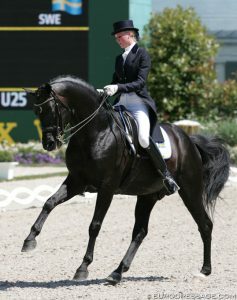 Under Carola Koppelmann, the black stallion had won the bronze medal at the 2005 Bundeschampionate and was becoming successful at Grand Prix level, finishing 8th at the 2009 German Grand Prix Championships. Antonia Ramel tried out the horse twice. The first time outside in the forest instead of in the indoor arena, as the seller’s representative disclosed that the horse was going to be on the German national team and they did not want anybody to know they were going to sell it. Ramel acquired the stallion as her future Grand Prix ride. Unfortunately only 2.5 months after the stallion’s arrival in Sweden he developed soundness issues and Ramel wanted to have him returned under warranty. They first tried the Swedish court, but as the horse sold in Germany, they were referred to German court. The case was first presented in the Court of Hanover, where they won, but the defendants appealed. Then the case moved to the Appeal Court in Celle, where Ramel won again. “The commission payments by the seller to the rider of Insterburg and his representative were as such not problematic for the Court of Appeal and its expert, the director of Landesgetüt Celle. Schultzke was free to do with the purchase price he had received what he wanted. However, I would say only in abstract terms because from my personal point of view a price of 1,04 million euro’s for a horse with severe injuries like Insterburg in 2010 was far too high,” said Ramel’s lawyer Piotr Wawrzyniak, who worked with Fischer on the case. The remainder of 560,000 euro was split between three further agents, Mr Baumeister (120,000 euro), Ralf Isselhorst (130,000 euro) and Ramel’s Swedish based Danish trainer (310,000 euro). Ramel was unaware that her own trainer and confidant had also received commission fee. “Problematic was the payment of 560,000 euro, of which the plaintiff Ms Henriette Ramel was not informed of and of which large part was paid to her advisor. This payment was fraudulent,” said Wawrzyniak. 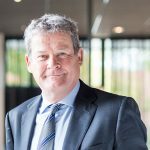 Taking payments by Schultzke to Koppelmann and Kretschmer into consideration, then Insterburg’s sales price of 1.6 million euro was made up 920,000 euro commission fees, far above the market standard of 10% to 20%. The court considered 560,000 euro of those fees fraudulent. Furthermore, Insterburg had health issues which had not been disclosed by the seller and were not obvious from the pre-purchase exam. Due to his career ending injury, Insterburg moved to the Zweibrucken state stud in 2013 where he has been standing at stud and being well taken care of.